If comfort is a top priority for you, you can't go wrong with the Ford Escape. This popular compact SUV is packed with interior features that make each drive comfortable and convenient. On long drives, clutching the steering wheel can become uncomfortable. The Ford Escape solves that problem with its ergonomically designed steering wheel, contoured to fit hands of every size. The steering wheel also comes with a heating feature, ensuring that the drivers hands are warm on chilly winter mornings. 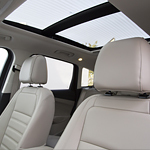 The Ford Escape also comes with a Panoramic Vista Roof, one of its most popular interior features. This large panel can open fully or tilt upwards; either way, it provides natural light to every seat in the vehicle. If you're a Matteson driver in the market for a family-friendly SUV, come to Sutton Ford Lincoln and take a closer look at the Ford Escape. You can take one out for a test drive today!